The institutional investment consulting industry is seeing increased consolidation in many forms for many reasons, while more investors are turning to outsourced chief investment officer services. Multiple major merger and acquisition deals have taken place in the last three months alone. In November, Goldman Sachs Asset Management announced its intention to buy Rocaton Investment Advisors LLC, taking over its $600 billion in assets under advisement. And in mid-August, Mercer announced plans to acquire Pavilion Financial Group's investment consulting business as well as Summit Strategies Group's defined contribution consulting and outsourced CIO businesses. At the same time, AndCo Consulting agreed to purchase Summit's public defined benefit plan consulting business. Mercer ranked No. 1 overall with $11.632 trillion in assets under advisement as of June 30, up 6.2% from the year before. The consulting giant's AUA should grow by roughly $845 billion from its recent acquisitions, widening its lead on Aon PLC, which advised on $3.118 trillion in assets as of June 30. "In the long run, the M&A game is probably going to continue," said Andrew H. Junkin, president of Wilshire Consulting. "I'm not sure that's so great for the industry." Consolidation may result in more homogenization, but the consulting business is best when fully customized to each client, he said. "Is this the best thing for the client or the best thing for the provider to build their own business? Sometimes the answer is not always clear to me," Mr. Junkin added. 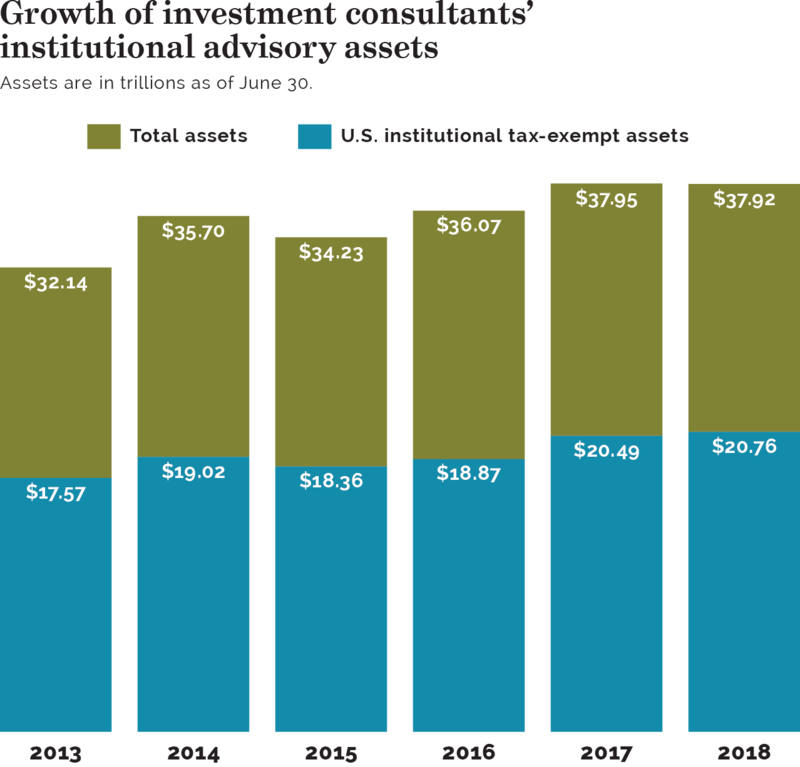 Data from Pensions & Investments show the overall U.S. institutional tax-exempt AUA was flat for the year — $20.76 trillion as of June 30, up only 1.3% from a year earlier. Investment consultants speaking with P&I agreed that consolidation will continue. However, they had varied explanations as to why. "There are multiple influencers that are causing the consolidation," said Steve Carlson, head of investment, Americas, at Willis Towers Watson PLC, in Chicago. Some of the primary influences leading to further consolidation include consulting firms trying to maximize their margins; owners of firms established in the 1980s and '90s looking to retire and cash out; firms looking to expand their offerings and capabilities and small- to midsized-consulting firms looking to be acquired to gain scale. Mr. Carlson said some deals, such as Mercer's acquisition of Summit and Aon's January acquisition of The Townsend Group for $475 million, are being done so one consultant can expand its capabilities within a specific asset class. In the case of Mercer, it was alternatives; for Aon, it was real estate. "Clients are seeking high-quality advice on alternatives," said Richard Nuzum, New York-based president of Mercer's global wealth business, in a telephone interview. "Alternatives are attractive but also risky." Mr. Nuzum pointed out that although alternatives are becoming increasingly attractive in a low-return environment, they require expert advice. "There's no passive investing with alternatives," he said. "You can't just stick this money in an alternatives index fund." Wilshire's Mr. Junkin said something similar about investor appetite for alternatives in a separate phone interview. "An ongoing push into alternatives has been going on for more than a decade," he said. "Consultant firms are trying to solve the dilemma for achieving returns in a low-return environment." Consolidation is also occurring due to senior leaders looking to retire. A recent example is Cambridge Associates LLC co-founder Hunter Lewis, who said on Nov. 6 that he was selling most of his stake in the firm after Cambridge in May sold 20% of the company to one its clients, Brussels-based Sofina SA. "A number of consulting organizations have the generational issue to grapple with," said Stephen Cummings, CEO of Aon Hewitt Investment Consulting Inc. "The industry's getting mature." These generational issues can trigger internal discussions within consulting firms about whether they should transfer ownership to the next generation or to a larger organization. Both options have their own inherent advantages and challenges. "Generational equity transfer is hard to do if you want it done in short order," said Michael P. Manning, managing partner at NEPC LLC in Boston. "At that point, a transaction is often the only real option." Both Mr. Manning said one reason why this ownership transfer tends to result in acquisitions is because internal buyouts tend to be slow and drawn out, while an outright acquisition is a much faster process. "It takes time to do a buyout," said Gregory Allen, CEO and chief research officer at Callan LLC, San Francisco. "If you can get big faster, it's better than getting big slower." Mr. Allen pointed to Callan as an example. When founder Ed Callan began transferring ownership of the firm in the 1990s, it was a long process. Since employees didn't have enough cash to buy him out, they had to agree forgo profit distributions and channel those dollars into periodic payments for Mr. Callan's ownership shares. "So, if a company approaches you and says, 'We'll retain as many people as we can, and we'll pay cash,' that's a good deal for a founder, especially one with a high percentage of ownership," Mr. Allen noted. The Callan CEO added that an acquisition is a shortcut to transferring ownership, and also offers more career opportunities for employees who are now part of a larger firm. Other deals, like the merger between Cafaro Greenleaf and Carroll Consultants Ltd., are being done so the organizations can partner with each other to more seamlessly serve clients. "Another reason why we're seeing this consolidation is because we're seeing a demand from asset clients for a wider breadth of services," said Mr. Manning from NEPC. Mr. Manning wasn't the only consultant who shared this view. Aon's Mr. Cummings also noted that institutional investors are expecting more from their consultants. "Clients are increasingly looking to consultants to provide highly-integrated flexible solutions, so their lives are simpler," said Mr. Cummings. "They don't have to go to multiple vendors." Aon, the second largest investment consulting firm, gained about $175.7 billion in AUA through its acquisition of Townsend. Clients' desire for comprehensive services is also driving them to take a closer look at outsourced CIO services. "We've been seeing the move toward OCIO or delegation," said Mr. Carlson at Willis Towers Watson. "That in our view is going to continue to happen." Mr. Junkin from Wilshire Consulting explained that the transition of non-discretionary consulting to discretionary is happening in part because many investors are recognizing that they "don't have the right governance structures in place to properly manage a portfolio." An institutional investor that meets with the investment committee every month or every other month may not be in the best position to invest opportunistically, Mr. Junkin said. So it makes sense to hand control of the investment portfolio to an OCIO. Plus, the traditional non-discretionary consulting business is not scalable. "I think the push toward OCIO will continue and is really adding value to the client," he added. OCIO assets grew 36.3% to $1.237 trillion as of June 30 from $907.3 billion the year before. With GSAM's acquisition of Rocaton, the New York-based asset manager is set to gain roughly $10 billion in OCIO assets. One OCIO provider said his firm made the move from traditional consulting to OCIO because that's where he believes the value lies. Michael A. Rosen, managing partner and chief investment officer of Angeles Investment Advisors LLC, Santa Monica, Calif., said: "We're seeing industry consolidation because traditional consulting firms have been unable to demonstrate sufficient added value and/or distinction among themselves that would lead to differentiated fees." Traditional non-discretionary investment consulting is "not the business that I want to be in," Mr. Rosen added. "So, we've shifted to being (OCIO)." Angeles Investment Advisors oversaw $27.4 billion in client assets as of June 30, down 6.2% from the year earlier. Consultants also noted that a number of investors moving toward delegation aren't necessarily ready to completely abdicate all control. While some clients may be interested in delegation, they may also want to retain veto power and have some say in how the assets are invested, explained Mr. Nuzum. What they ultimately want, however, is to be relieved of the operational burden to run and maintain an investment platform. "It costs a lot of money to build a high-quality OCIO platform," Mr. Nuzum said. Aon's Mr. Cummings said his firm has seen "partial delegation" start to "take off in the U.S.," though it has been the norm in the U.K. for years. This includes scenarios in which "a client isn't ready to fully embrace an OCIO but might be comfortable outsourcing a hedge fund implementation program or real estate program or a long-duration fixed-income portfolio on a fully discretionary basis."